Our Ambassador to Japan, Isikeli Mataitoga speaks candidly on Japan-Pacific Island Countries Relations and the future of the Pacific Alliance Leaders Meeting (PALM) Summit. Pacific Island Society: At PALM6, participants adopted the Okinawa Kizuna Declaration, which highlighted five themes for follow-on action: (1) response to natural disasters (2) environment and climate change (3) sustainable development based upon human security (4) people-to- people exchanges and (5) maritime issues. How have the participants faired in fulfilling their commitments in these areas? Ambassador Mataitoga: It difficult to make the assessment you have posed in your question. The reason for that is that no criteria are provided for each of the five areas you have rightly identified as focus areas under the Okinawa Kizuna Declaration of PALM6. There is a financial envelope that Japan has stated it has made available for these five areas of development activities. The amount in the envelope is USD $500 million over a three-year period. Only one party – Japan – knows how this money is spent and how much is left. This is where the lack transparency is most evident and why sometimes difficult to understand the claims being made in some quarters on how this funds have been utilized. Pacific Island Society: For PICs, one of the key facets of the PALM Summit is aid. Yet, Japan is yet to fulfill its three-year pledge to give US$500m. In contrast, China’s presence in the region has been increasingly noticeable. Between 2006 and 2011, China is estimated to have contributed US$850m in bilateral aid to eight PICs. Your counterpart in London even remarked, ‘China stepped in when other western development partners, such as the US and the UK, withdrew’. From your perspective, how does Japan’s delivery of aid affect its strategic partnerships with PICs vis-a-vis China? Are PICs expecting more from Japan at PALM7? Ambassador Mataitoga: First thing first – Japan must decide what are its foreign policy objectives regarding its relations with the PICs. Having decided on that, it must state it clearly and denominate the framework to deliver those objectives. If we ask, MOFA for their foreign policy priority in PICs, the reference you may be given is the PALM Process. Apart from that, there will be a general reference about Asia-Pacific Security issues. As I earlier noted in PICs with severe climate change adaptation issues, Japan’s aid delivery does promote a positive impact in its bilateral relations. But it should be note that most PICs do not engage with Japan in competition with China. Rather, they see relations with both Japan and China as complimentary to their respective development goals. The difficulty with PALM7 is the process. The issues to be discussed are highly controlled by Japan. There is little real engagement with senior officials from the PICs to work up the agenda for PALM and to promote ownership amongst all the parties. In terms of expectation, there is therefore little to expect because PICs are in the dark in their understanding of the actual financial resources available and how they would be used. In the case of Fiji, we would like PALM to address issues of market access for Fijian made goods and services into the Japanese market. This is a forlorn hope because Australia and New Zealand are members of PALM and they would demand similar concessions. We also would want the next PALM to be hosted in one of PICs – to make a truly Pacific Island and Japan framework for development. Pacific Island Society: A fellow at the Center for Strategic and International Studies (CSIS), Greg Polling, recently criticized Japan’s leader-centric approach to engagements with PICs – specifically citing the PALM Summit as an example. How would broader stakeholder participation in the PALM Summits affect the achievement of improving Japan’s ties with PICs? Ambassador Mataitoga: Before Mr. Poling made his observation, I was saying this very point to relevant officials in Gaimusho here in Tokyo. If Japan were to be more open and inclusive in its engagement with other important and vital stakeholders in PICs – as referred to in your question – I have no doubt that the Japanese Government image would be much more enhanced in these countries and communities. There is great power in open and inclusive engagement. I believe that widening the participation in PALM to include other stakeholders in development in PICs and Japan will lead to more enhanced relations amongst them. There is so much that the PALM process could benefit from in terms of development expertise. From high-level personnel with valuable experience – the think tanks, civil society, private sector representatives, etc. Japan uses these same stakeholders in the development its own national development goals. It should not be too difficult to do the same with the PALM process. The issues of reviewing the PALM process have come to the fore only since PALM6. And, the issues coming up are membership and whether participation should include stakeholders in development within PICs. For Fiji, PALM is a disguised Pacific Islands Forum (PIF) with Japan as the chief coordinator. And, as our PM recently stated, unless PIF undergoes certain fundamental changes, it is unlikely that Fiji will rejoin. Pacific Island Society: At the last PALM summit, there was a significant change in membership with the inclusion of the United States. As a significant partner for Japan and many PICs, how will Japan’s strategic alliance with the US impact future PALM agendas and the power dynamics of the meetings? Ambassador Mataitoga: In fairness to Japan, the number one priority issue in any country’s foreign policy is its national security interest. To that extent, it is understandable that Japan often treads very carefully in its diplomatic engagement, whether in develop assistance diplomacy or any other area, that it does not violate its relations with United States – especially if it may be seen [optic again] by Washington to be likely to weaken their “Pivot to Asia” policy. The Japan – United States Alliance directly impacts how and when Japan engages with PICs – generally and on specific issues. How else would anyone explain Japan’s proposal to include the United States into PALM? The question I wish someone to answer is: Why does the United States need to go through PALM to engage with PICs? The United States has a similar framework already in existence, which has been dormant for a while. What are factors [real or imagined] that prevent the United States consulting directly with PICs? Pacific Island Society: This will be the first PALM Summit since your country successfully held democratic elections earlier this year. Given your absence from PALM6, what goals does Fiji hope to achieve in the upcoming meeting? 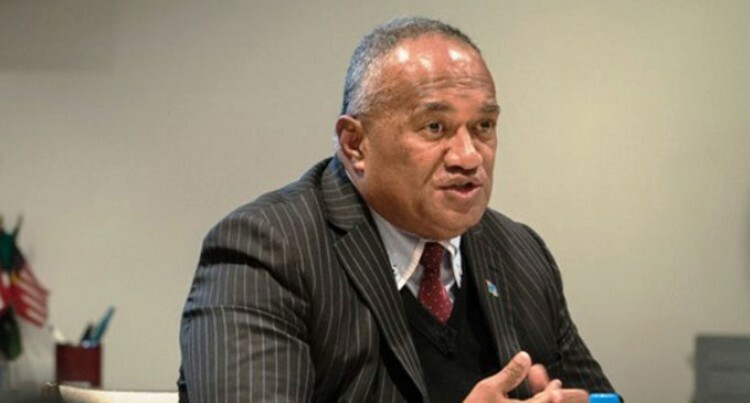 Ambassador Mataitoga: Fiji’s attendance at PALM7 is not a foregone conclusion. Fiji will have to be invited first. We were asked to submit our views on the PALM process by Japan. These have been prepared and submitted to relevant representatives of the Japanese Government. Within that submission are the issues that we would like Japan to consider. We are confident that it will be given active considerations. Pacific Island Society: How has Japan’s position on the coup in the past impacted relations? What are bilateral relations between Japan and Fiji like today? Ambassador Mataitoga: Japan did not terminate its diplomatic relations with Fiji following the change in government in Fiji in late 2006. This was in sharp contrasts to other countries, which suspended diplomatic relations with Fiji. This was a sign of maturity in Japanese diplomacy because they kept the door open for dialogue with Fiji – which was essential in promoting understanding during those difficult days. The first few years 2007-2012, were difficult years in Fiji – Japan bilateral relations. Since the Japanese Parliamentary Election in December 2012, the new Japanese Government has been more willing to engage with Fiji. And, these thawing of relations will be further enhanced following the election in Fiji on 17 September 2014. Now Fiji and Japan are discussing high level of political leaders visit to each other’s country. This will further lift relations to new heights. Pacific Island Society: Earlier this month, Japan won membership of the Pacific Islands Forum while at the UN Meeting in New York. Outside of PALM, this appears indicative of Japan’s increasing attention to the Pacific Islands Region. During this time, leaders called on Japan to focus on climate change, Sustainable Development Goals, and the SAMOA Pathway. With this in mind, what do you think this means for Japan’s role in the region? Ambassador Mataitoga: Japan’s desire to deepen its engagement with PICs was first made at the PALM Ministers of Foreign Affairs meeting in Tokyo in 2013. At this meeting the Japanese Minister of Foreign Affairs stated Japan’s desire to be more involved in PICs region. Fiji supported the statement of the Japanese Minister and proposed that Japan should be a member of the PIF. Having proposed this to the meeting, Fiji asked Japan to clearly articulate the role it would like to play when they join. This would allow other members who were silent to the proposal to better evaluate the Japanese desire. This is still to happen. On the role Japan may play in PICs countries, it is something that the Government of Japan, the wider stakeholders in Japan, and PICs need to discuss and articulate publicly. Pacific Island Society: What does Fiji hope to gain from Japan (especially in terms of trade) in the future? Will Japan be able to realize its traditional economic objectives (ex. fisheries) and emerging (ex. oil, gas, deep-sea mining) interests in the region? Ambassador Mataitoga: Fiji looks to Japan for Small and Medium Enterprise Investors and the development of cooperative business relations that would enhance the development of our agricultural sector to be competitive. In particular Fiji needs Japanese farms technology, management skills and knowledge, in developing on a commercial scale agro-processed products for the Japanese and other overseas markets. In this regard, opportunities for fresh fruit and vegetables, fruit and vegetable extracts, alcohol, water, spa & wellness products, food items etc., would be a priority. Japan is already a large importer of fresh and frozen tuna from Fiji. This will grow in the future and may also target processing these for canned tuna etc. In certain boutique products like pearl, Japanese participation is already significant. In the tourism sector, Japanese interest has grown significantly with some hotels now owned and operated by Japanese for Japanese visitors. Public utilities sector may be of interest to Japanese Companies. And, I hope that one or two of the major projects in the comings years will be built by Japan. These kinds project do carry a high level of diplomatic footprint with them. As regards, Deep Sea Mining (DSM) Fiji is still at the prospecting stage. And, the actual mining of seabed resources will be open to Japan – just as it will be open to any other countries.